SCVHistory.com | Saugus | Original Saugus School Bell Through the Years. Original Saugus School Bell Through the Years. The Newhall Signal and Saugus Enterprise | Thursday, September 22, 1932. The school bell was taken from its place in seclusion, dusted and made ready for use Monday morning. Thirty-nine children with fresh clothes and happy faces seemed eager to hear the old bell ring. New books, new pencils and an excellent supply of working material made the beginning of school bright. Mr. and Mrs. Roy Clint were on hand Monday morning to organize the orchestra and glee club. We expect over half the school to play in the orchestra, as the number of instruments has been increased. We have added two small xylophones, a drum, three cymbals, three tambourines, four triangles, a Chinese drum, and rhythm sticks, chimes and jingles. Any child so desiring may play in the orchestra. This in eludes the tiniest as well as the larger children. It seems like old times to have Walter Barnett with us again. Everyone missed him. We are glad to welcome several new children to school. They are nice appearing young folks. Virginia Lee Hale is staying with her aunt and attending school in Los Angeles. We wonder if her perfectly good intentions will last as long as they did last year. At any rate we miss her. About three hundred books, no two alike have been ordered for our library tables. They range from those of the pre-primer type to those the advanced students will enjoy. All types of both stories and poetry are included. If a child learns to worthily use his leisure time, he will have little trouble as an adult. The Newhall Signal and Saugus Enterprise | Thursday, June 11, 1953. School's end is too close to get much done now, but sometime after the opening of The Saugus Union School in September, there is going to be a dedication program there with a good deal of historical interest connected with it. 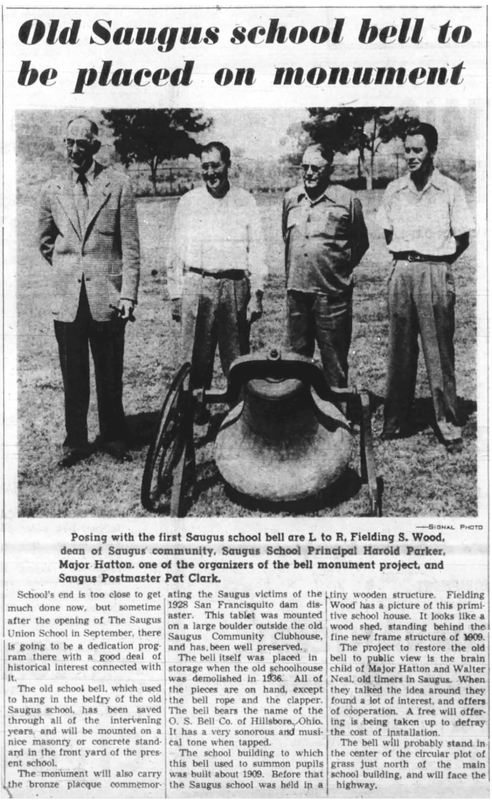 The old school bell, which used to hang in the belfry of the old Saugus school, has been saved through all of the intervening years and will be mounted on a nice masonry or concrete standard in the front yard of the present school. The monument will also carry the bronze plaque commemorating the Saugus victims of the 1928 San Francisquito dam disaster. This tablet was mounted on a large boulder outside the old Saugus Community Clubhouse, and has been well preserved. The bell itself was placed in storage when the old schoolhouse was demolished in 1936. All of the pieces are on hand, except the bell rope and the clapper. The bell bears the name of the O.S. Bell Co. of Hillsboro, Ohio. It has a very sonorous and musical tone when tapped. The school building to which this bell used to summon pupils was built about 1909. Before that the Saugus school was held in a tiny wooden structure. Fielding Wood has a picture of this primitive school house. It looks like a wood shed, standing behind the fine new frame structure of 1909. The project to restore the old bell to public view is the brain child of Major Hatton and Walter Neal, old timers in Saugus. When they talked the idea around they found a lot of interest, and offers of cooperation. A free will offering is being taken up to defray the cost of installation. The bell will probably stand in the center of the circular plot of grass just north of the main school building, and will face the highway. By Fred W. Trueblood Sr., Editor. If you want any local history the man to go to is Abie Perkins. If you want to get the History of Historian Abie, the man to see is Curly Aitken. Curly says nobody should be more interested in that Saugus school bell project than Abie. Because it was that bell cured Abie's astigmatism or ophthalmia, or whatever it was that had made Ahie wear glasses for most of his previous life. According to Curly, Abie was personally engaged in salvaging the lumber in this structure after he bought it from the Saugus School Board in 1935 or '36. He was standing directly under the belfry when some of the props gave way (or maybe some Saugus joker yanked them away). Anyhow, the belfry, bell and all, crashed down right on top of Abie, who had to remain in bed for quite a while afterward. But when he recovered he discovered that his eyesight had been miraculously corrected, and he didn't have to wear glasses any more, even to read the fine print on a lease or contract. In spite of his wonderful cure, Abie does not recommend the treatment for anybody else. And furthermore, Curly opines, money may not grow on trees, but there are some limbs that attract it. The Story of Our Valley (Exerpt). The Newhall Signal and Saugus Enterprise | Thursday, December 16, 1954. Somewhere in Saugus there is a bronze plaque, suitably inscribed to the memory of 28 members of the Saugus Women's Club lost in the flood artistically etched by Lloyd Houghton. The plaque originally was placed on the hill side behind the Club house. That, however, was sold and became a private residence about 1942. 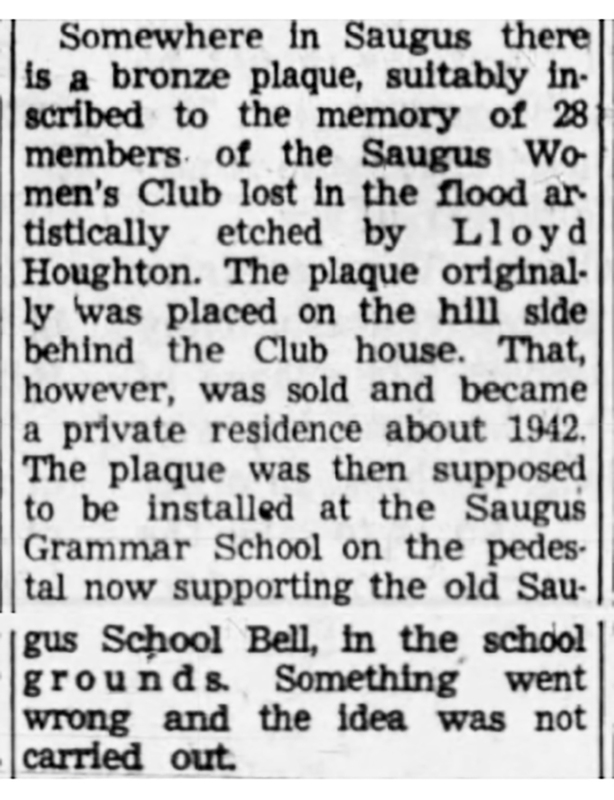 The plaque was then supposed to be installed at the Saugus Grammar School on the pedestal now supporting the old Saugus School Bell, in the school grounds. Something went wrong and the idea was not carried out. The Newhall Signal and Saugus Enterprise | Thursday, April 23, 1959. A plaque dedicated to the memory of victims lost In the 1928 St. Francis Dam disaster has been placed at the base of the original Saugus School Bell mounted in front of the school. Preserving the Past for the Future (Excerpt). By Sandra Forbes, Santa Clarita Valley Historical Society. The Signal | Progress Edition, Sunday, February 10, 1991. Why Did Saugus School Close?